← I’m Not a Pheasant Plucker . . . 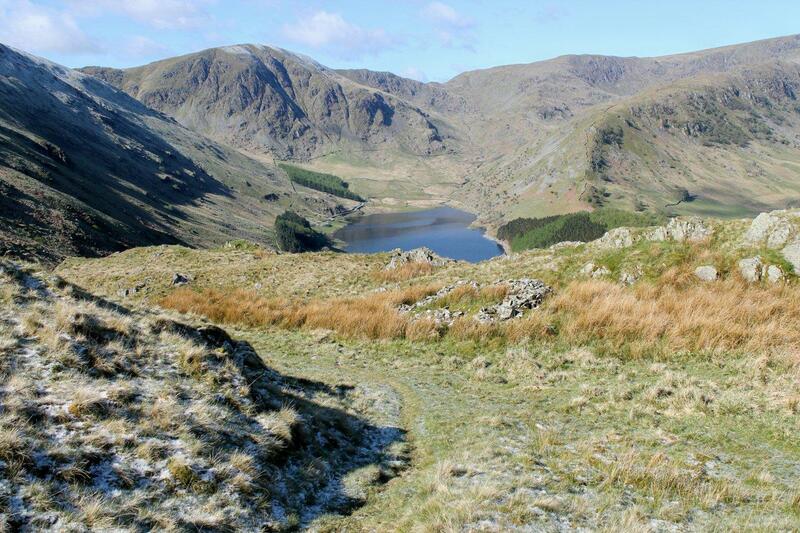 THE last person to leave Mardale feet first for Shap was John Holme, in June 1736. Poor old John was as dead as they come. Whether he was strapped to a packhorse or nailed in a coffin and carried on the shoulders of four stout lads is a point open to debate. But he was the last person to make the journey along the old corpse road in the traditional fashion. And he brought the curtain down on a practice that had endured for centuries and was shrouded in myth and superstition. God rest his soul . 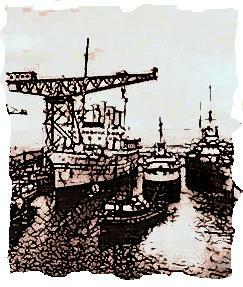 . .
I’m retracing John Holme’s final journey. You could say I’m following in his wake. It’s something I’ve planned to do for a couple of months. So I’ve abandoned the car in Wet Sleddale, clambered over the fell and brewed up in Mosedale bothy, then continued over Gatescarth Pass to the serenity of Mardale and a lonely grassy sward where I’ve pitched the tent. 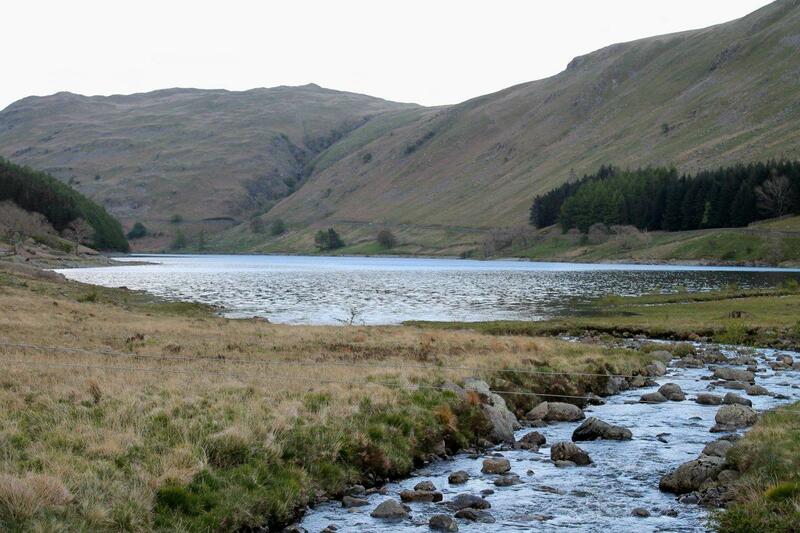 At the moment, hail is drumming on the flysheet and a wind is roaring along a grey and choppy Haweswater. So far as I can tell I’m the only living being in this neck of the Lake District and night is approaching. So let’s talk corpse roads. I recall being told about corpse roads by my art teacher, Stuart Lawrence, at secondary school. When a remote community needed to bury its dead, the coffin was borne to the nearest consecrated ground – but that could be many miles away across the mountains. Friends and relatives of the deceased carried the coffin along a designated route – the corpse road. That was the crux of it. It crossed my mind at the time that it would have made life – and death – so much simpler just to consecrate some ground in the remote community. But things didn’t work like that, I realise now. I hadn’t taken into account traditions that stretch back into the pre-Christian past, the deep-seated superstitions of an uneducated people, unsettled spirits and mischievous sprites, and an uncharitable Church that had a vested interest in controlling supply and demand in its burial plot franchise. It might have been a dying trade in one sense – but there was plenty of it and it provided a lucrative income. 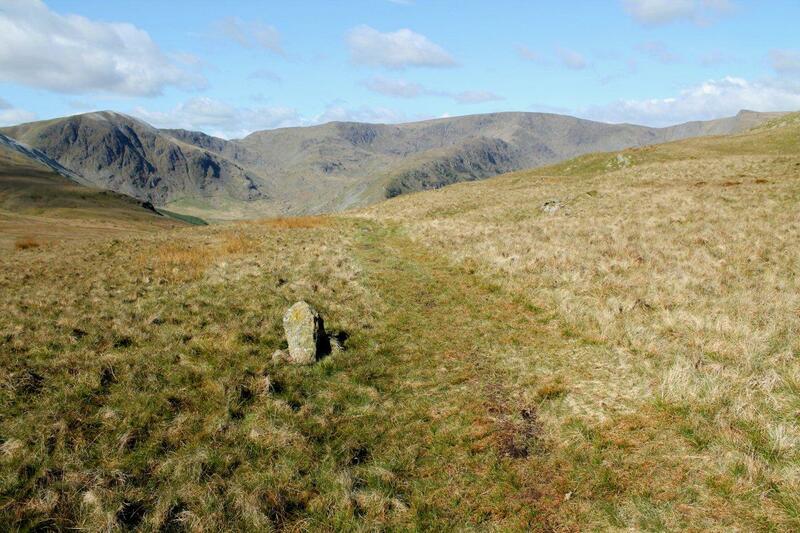 John Holme wasn’t only the last man to be carried from Mardale over the mountains to Shap; he was the last Mardale resident to be borne past Shap’s Neolithic monoliths, and the last to shake off evil spirits on the journey. John Holme ended an era and took a load of hokum with him to his grave. God rest his soul. At 10.20pm I’m lying in my sleeping bag when I feel a presence. My left ear, which is pressed to the ground, senses the vibration of footsteps. 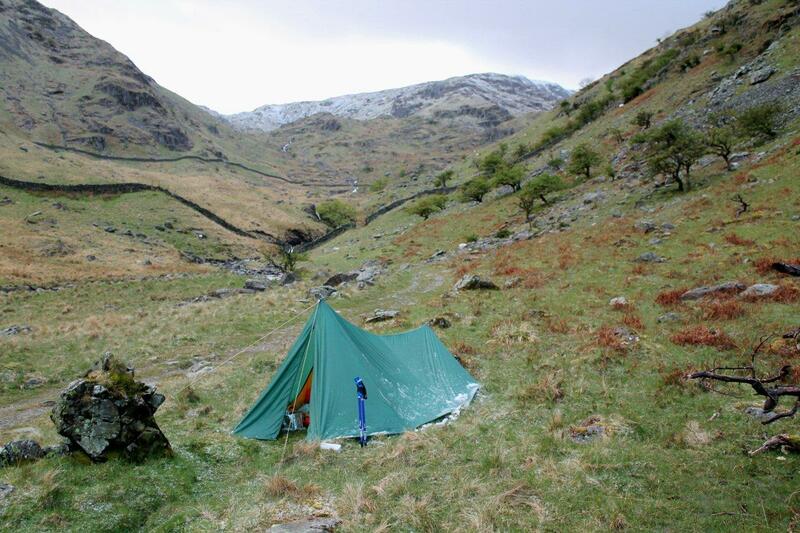 The vibrations become noise as someone passes within a couple of feet of the tent and plods off into the night. Jesus Christ. 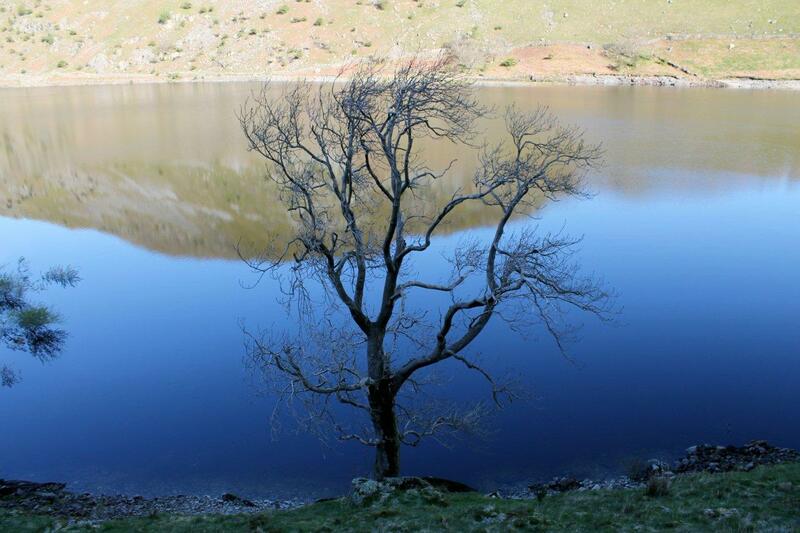 Who can be abroad at this hour in the darkness of a desolate Lakeland valley where no one lives? John Holme? 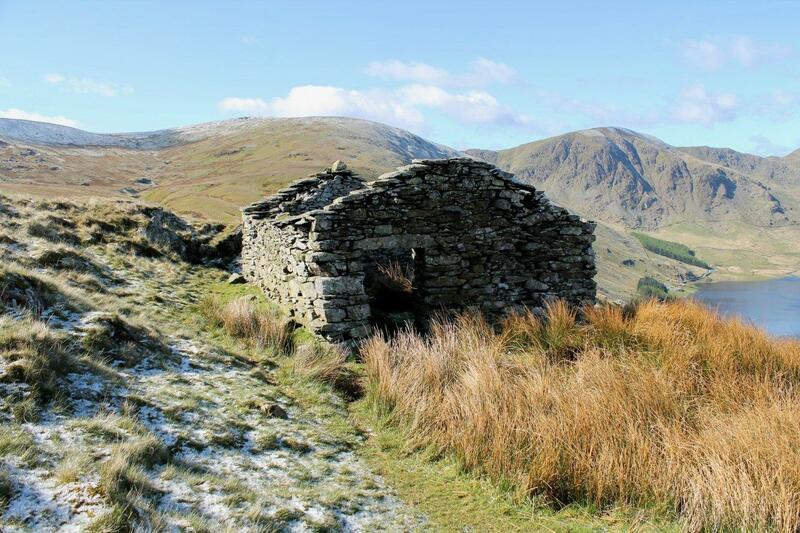 Mardale no longer houses a community of farmers and shepherds. 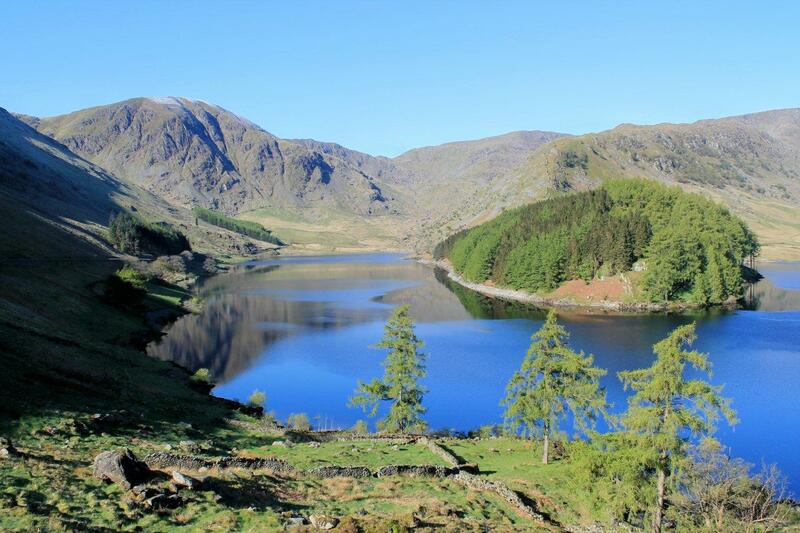 Like their neighbours across the fells in the Thirlmere valley, they were dispossessed by Manchester Corporation – their homes and farmsteads disappearing beneath the cold waves of unlovely reservoirs. Mardale has been socially cleansed. It is not a place where men walk in the night. The footsteps do not return. I close my eyes and dwell on mischievous spirits – and the sins of the Church and the cotton barons of Manchester. Outside the tent, the world is still and unseasonably icy. Inside, I’m quite comfortable in my sleeping bag. Likewise, John Holme’s quite comfortable in his grave. I hope. A BRIGHT sun streams into the tent when I unzip the flysheet at 6am. Last night’s hail is still white on the ground – an indication of the temperature – but it’s disappearing fast. Breakfast is green tea and cous-cous, followed by more green tea. Then I pack my gear and I’m on the move for 7.55am, heading east towards the sun and the shadowy wall of fellside that rises steeply from the shores of Haweswater. Let’s now talk “mother church”, because these two words are at the heart of the corpse road phenomenon and form the main foundation blocks. It was mother church that dragged our corpse road from its origins in the distant past into the 18th Century and John Holme’s funeral. The term “mother church” has many meanings within the Christian religion. But we’re concerned with only one. In late mediaeval times, the mother church was the main place of worship within a parish. As the population increased and outlying valleys became inhabited, “daughter churches” and chapels of ease were erected to serve their communities. But the mother churches retained their monopoly on burials and baptisms. It was a power thing and a revenue thing, apparently – a bit of mediaeval control freakery. You want your Auntie Ada buried, do you? Fine. Bring her to the bosom of the mother church, where 70 years ago the old dear was baptised. Drop your pennies on the plate, thank you very much. And to bring the flock and its dead to the mother church, pathways radiated from the burial grounds to distant corners of parishes. These were the corpse roads. A few still exist but most have dropped through the holes in our knowledge like soil trickling through the fingers of a priest. In Cumbria, as well as Mardale to Shap, Wasdale Head to Eskdale across the wilds of Burnmoor is one of the known routes, as is Rydal to Ambleside. Then things become a shade more hazy. Ulverston to Coniston has been suggested, as has Greystoke to Johnby. What is clear is that a great deal of tradition has evaporated into nothingness. I can see my corpse road as I plod along the lakeside. It snakes up the fell in sharp zigzags, climbing through bracken to the blue of the early-morning sky. Soon I’m huffing round its angled corners and puffing up its gradient. By Christ, it must have been gruelling work bearing your grandfather’s coffin up this slope. 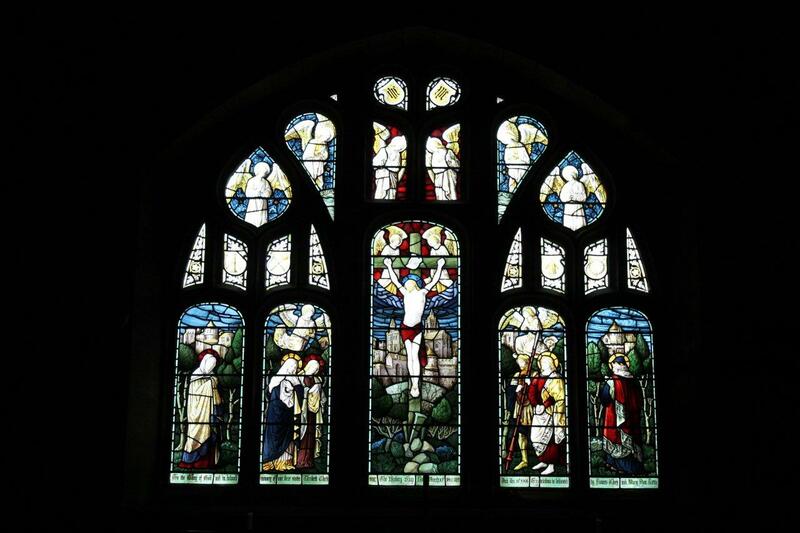 We’ve Shap’s mother church – St Michael’s – to thank for that. 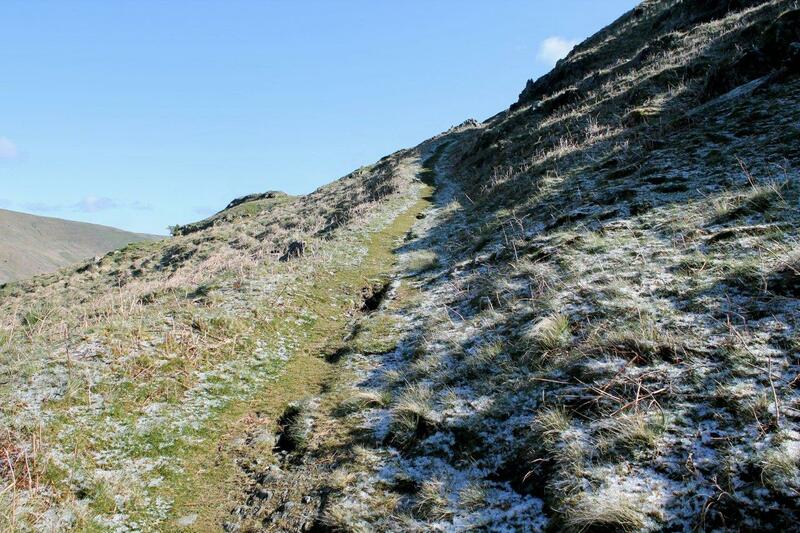 There’s a scattering of ruins near the top of the slope, where the path begins to level out on the shoulder of the fell. I suspect these buildings were built for storing peat, but I might be wrong. 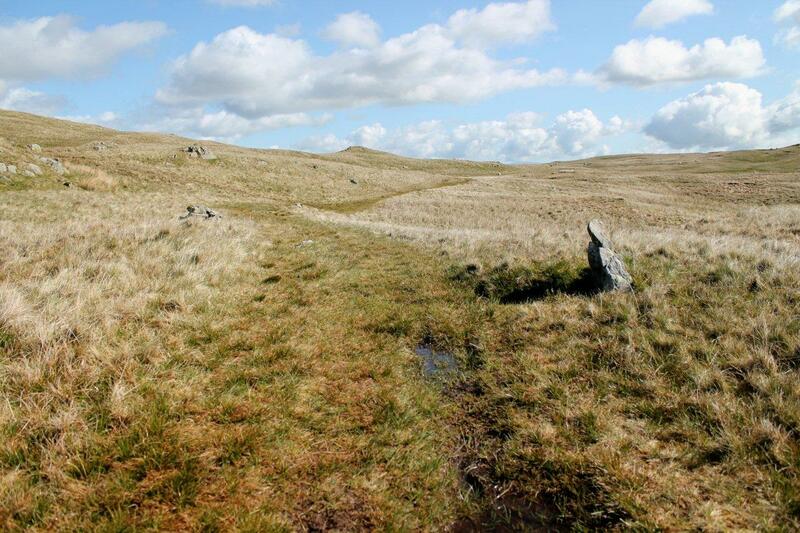 Below this point, the corpse road has been cut into the fellside, probably for the passage of sleds and packhorses. 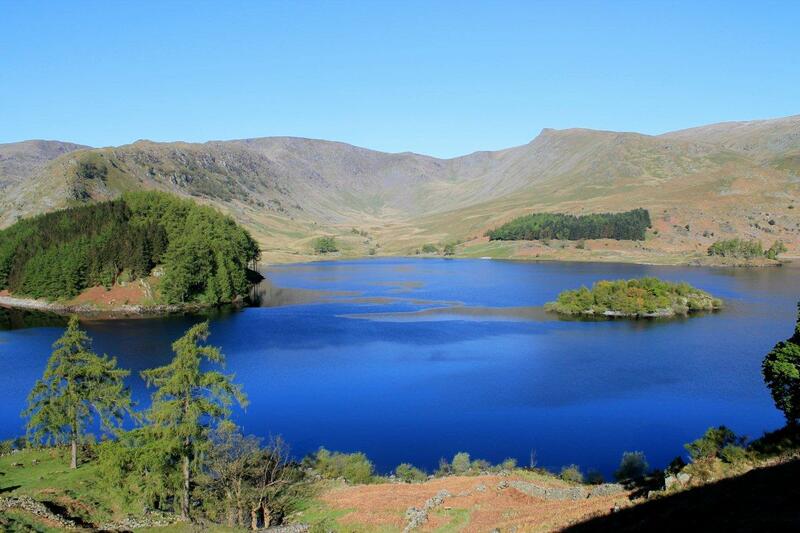 Let’s not forget that Mardale had a farming community – Mardale Green – that prospered from the mists of time up to the 1930s when the valley was flooded. Trade went in and trade came out. 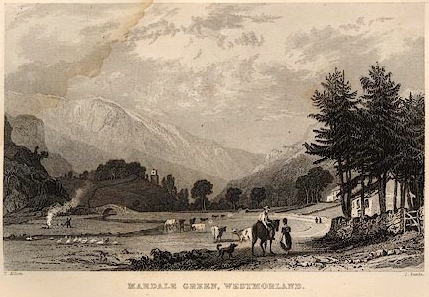 For instance, in 1860, according to Roads and Tracks of the Lake District by Birian Paul Hindle, Mardale was dispatching 3,000lb of butter every week to Manchester on the railway from Shap. That’s a lot of butter. And the quickest way to transport all that butter to Shap station was along the corpse road. 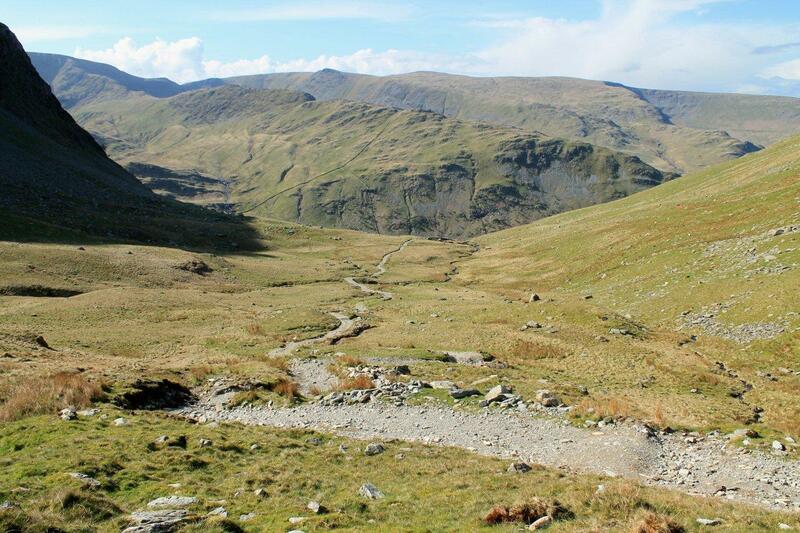 These mountain passes that we now accept as walkers’ routes were the main roads of their day. Honister, Kirkstone, Whinlatter, Wrynose and Hardknott have been upgraded for the passage of vehicular traffic. But Gatescarth, Nan Bield, Styhead, Walna Scar, Sticks, Stake, Black Sail and Scarth Gap were equally as important in so far as trade and travel were concerned in the days before the petrol engine. Incidentally, Sticks Pass and Stake Pass take their names from the sticks and stakes that guided travellers in poor weather. So it’s not just a corpse road I’m following, it’s a highway that once saw a great deal of traffic, including packhorses, sleds, peddlers, priests, and the faithful flock making their way to Shap. That’s why it’s so well graded and engineered on the steep bits, and why it is still discernible as it cuts across and over the fell. On the flat bit at the top, though, things take on a different aspect. LET’S move on to mischievous sprites and the spirits of the dead. I don’t want to alarm you, but we are not alone in this world. We share it with a load of entities which, because of their ability to avoid detection by the majority of mortals, are seldom seen. This is where historical fact gets bogged down in superstition – literally. The superstitious believed that spirits could not cross water, and so corpse roads were often taken through marshy ground and rivers to prevent the dead returning to their homes and scaring the daylights out of the living. 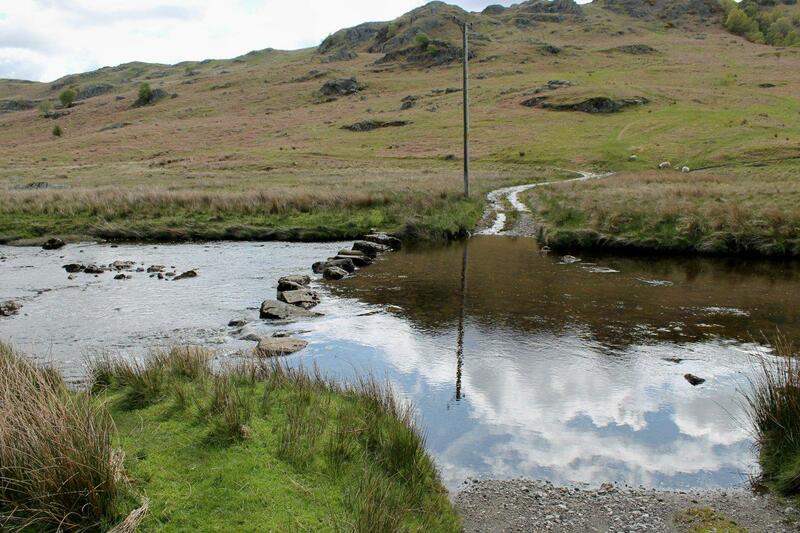 Bridges were said to strike dismay into spirits; fords and stepping-stones confounded them. Crossroads were deemed desirable things to chance upon because they were said to bind spirits to that place. That is why, apparently, gibbets were often erected at crossroads. A benevolent spirit wandering the countryside is one thing – the spirit of a wife-killer or a no-good donkey thief is another. Corpse roads were always as straight as possible, taking a direct line between the settlement of the deceased and the mother church. The more pragmatically-minded might raise the valid point that if four people are carrying a dead man seven miles, then the road would need to be as straight – and therefore as short – as possible for practical purposes; and in being so it would inevitably cut through any bogs and rivers that were in its way, and form crossroads at any highway it intersected. But let’s not spoil things. Corpse roads were said to have been swept regularly to remove any traces of the dead that might attract malevolent otherworld beings. There was also a tradition of people being employed to watch corpse roads for renegade spirits. Only those who possessed special powers, those whose eyes could see the dead, could do this – but it sounds like a good job. Bodies were always carried feet first. This was another means of confounding the spirit’s attempts to return to his or her fireside. Four men were charged with this task, and at set points along the corpse road they were relieved by another four following behind. When the changeovers took place, the deceased was placed on a specially-positioned stone called a lych stone – lych being Anglo-Saxon for corpse. The lychgate of a church is where the parson greeted the coffin at the end of its journey. If your local church has a lychgate, it’s probably a mother church. Ghost of Burnmoor: A young dalesman had died and his coffined remains were being taken over the moor when suddenly the horse took fright at some invisible being, bolted and was lost. The shock of this happening so grieved his mother that she died, and at her funeral in the snow her horse also ran off quite near to the scene of the first occurrence. Some men eventually found the first horse and completed the burial with reverence, but no trace of the second horse was ever found. It is now stated that in times of storm and mist, a galloping horse with a dark box-like shape on its back thunders past anyone who happens to be on Burnmoor. On the crown of the pass I encounter my first bog. Has the corpse road been deliberately taken this way to thwart renegade spirits? 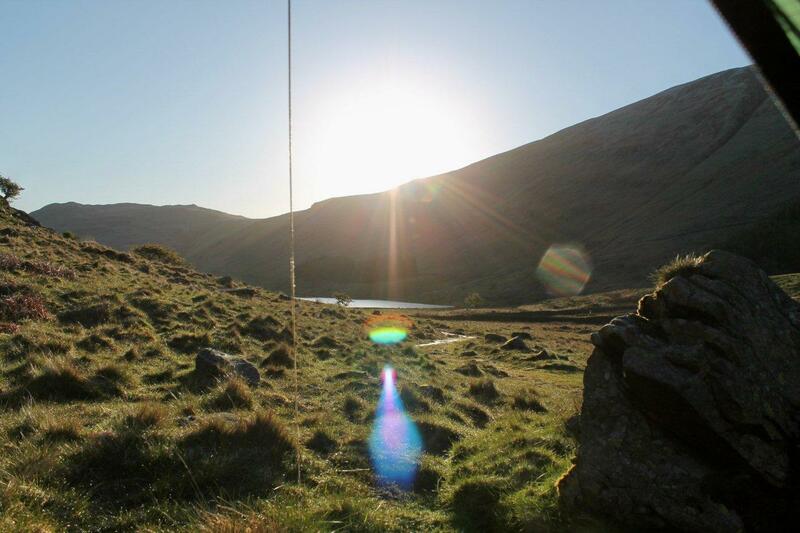 Or is it because the bog lies slap across the direct line from Mardale to Shap? We shall never know. Interestingly, though, this section of the corpse road is marked by stones that have obviously been in place for hundreds of years. Assured by the certain knowledge that the spirits can’t get me, I squelch onwards across the fellside and descend another steep zigzag section into Swindale, where the ancient highway once more resumes its straight and unflinching course towards the distant, and as yet unseen, church of St Michael. Swindale, which is always an absolute pleasure to walk through, has the ultimate anti-spirit trap – a set of stepping-stones right on the line of the corpse road. The bog might have been a coincidence but the stepping-stones are the genuine article. They were set here for a purpose, and that purpose was the conveyance of people between Mardale and Shap. There is a modern footbridge situated a few yards downstream which I’ve used in the past – but I’m walking with John Holme so I take a chance on the stones, which is not easy with a full pack on my back. I manage to stay upright and dry. My route then passes beneath the curiously-named Trussgap Brow on a well-defined grassy track to a second bog on Lanshaw Hill. I’ve noticed several boulders, by the way, that could have been used as lych stones, though I have no way of confirming this. Still, the fact remains that bodies were borne along this route for several hundred years, and occasionally the bearers would have stopped for a breather. The boulders can’t all have been randomly placed by the forces of nature. At Keld, after crossing the River Lowther on a modern bridge, I encounter an ancient chapel of ease. There’s a notice on the chapel that states that visitors wishing to view the interior should approach Mrs Taylor, who lives in the nice house opposite. As luck would have it, Mrs Taylor is crossing the lane with the key in one hand and a vase of flowers in the other. She shows me around the chapel, which, she tells me, has no connection with the corpse road other than the fact it is situated right on it. 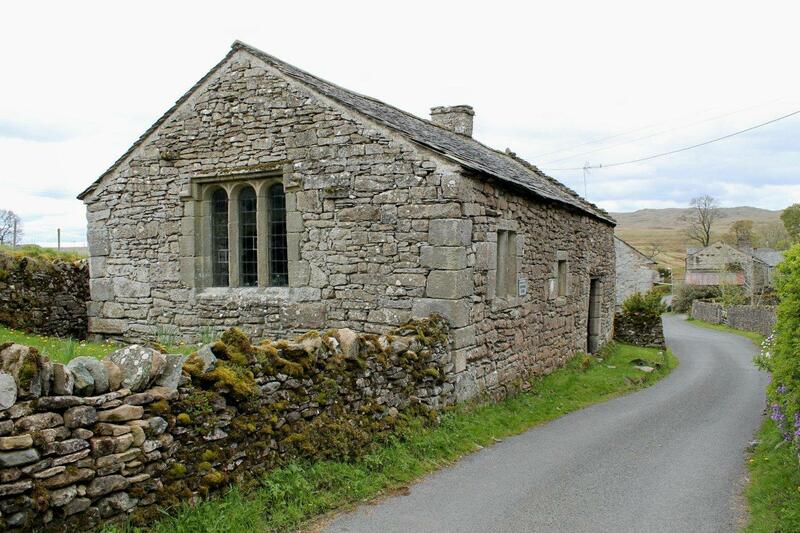 According to the Visit Cumbria website, the chapel was built as a chantry for nearby Shap Abbey. I spend a pleasant ten minutes chatting to Mrs Taylor and poking around the ancient structure before slinging my pack on my back and trudging off once more in the direction of Shap. The corpse road now passes through pastureland as it nears the village. 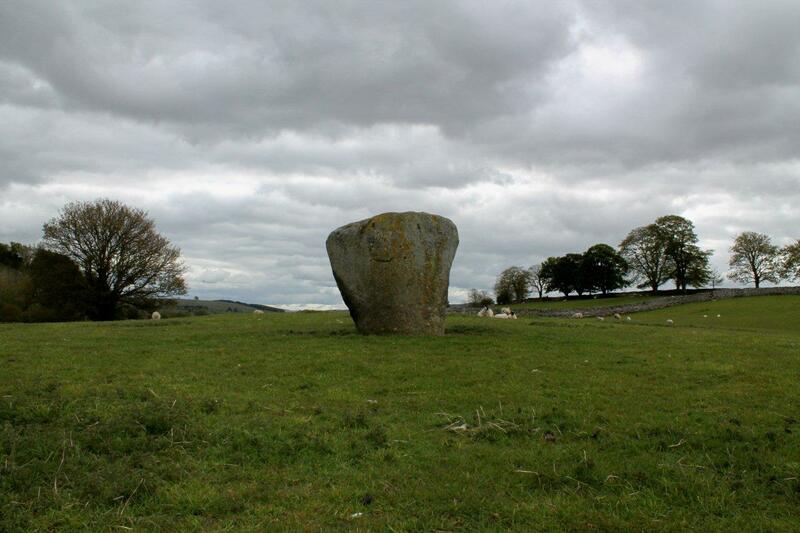 In one field is situated the Goggleby Stone – a sad though impressive remnant of a prehistoric monument that was butchered for building materials by people who knew no better. Does this Neolithic creation have any associations with the origins of the corpse road? Or is it, like the bogs, merely on our straight line? I don’t know the answer to that. I climb a small hill between neat stone walls, and suddenly the tower of St Michael’s Church rises before my eyes above the roofs of Shap – directly on the line of the corpse road. I am impressed. I truly am. 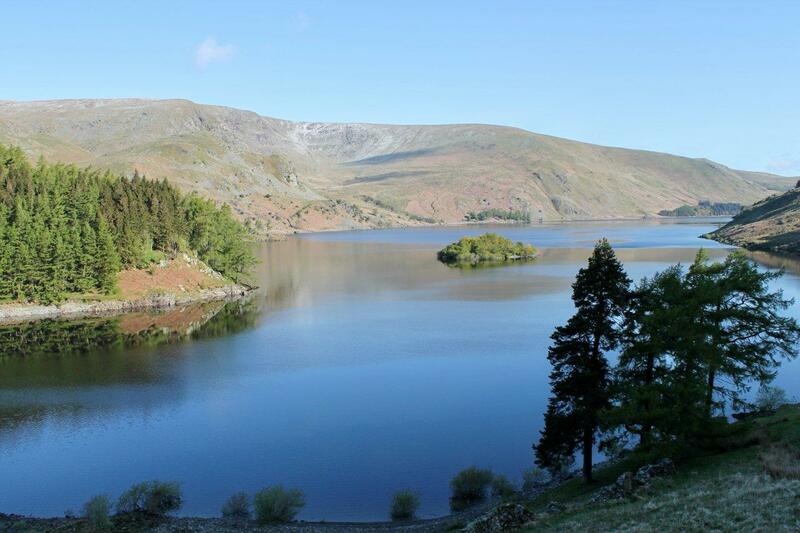 Hundreds of years ago, to the people of Mardale making this journey, this must truly have been a wondrous sight. Ten minutes later, I’m sitting bareheaded in a pew as sunlight streams through stained glass windows and silence fills the church. There has been a place of worship on this site since 750AD, with a stone church erected in 1150. St Michael’s was extensively rebuilt in 1898, so perhaps John Holme’s funeral procession was not greeted by the sudden view of the tower rising above the fields. Never mind. This is a time to sit and contemplate, then perhaps seek refreshment in the coffee shop I spotted while crossing the busy A6, dodging the Eddie Stobart lorries. One last thing to mention. I’ve a couple of miles to trudge across another bog to return to my car in Wet Sleddale. But John Holme’s family and friends have the entire corpse road to retrace. Off they go as the afternoon cloud swallows the sun, clad in their Sunday best with their stockings and skirt hems dark with mud and shoes oozing peaty brown water from the Westmorland bogs. But they won’t have to do it again because poor old John was the last. God rest his soul. I MUST thank my fellow blogger Danny at Teddy Tour Teas for providing much of the background material for this article. 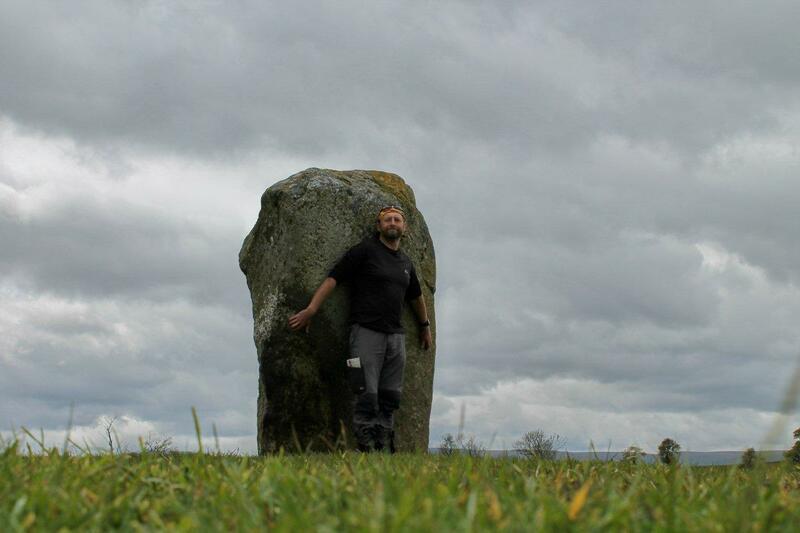 Danny kindly kicked over a few molehills and unearthed some real folklore gems. Cheers, Danny. FOR an illuminating website containing invaluable information and pictures of the now-vanished Mardale Green and its Holy Trinity Church, which was finally granted burial rights in 1728, click here. 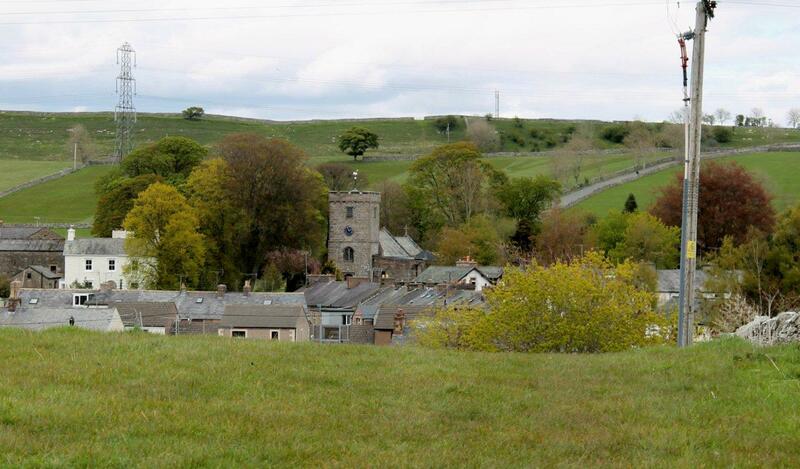 St Michael’s Church, Shap, has a history far longer than many English churches. For a fascinating historical account, click here. I was not aware, until researching the corpse road, that Swindale, too, had been socially cleansed for a reservoir scheme – one that never came off. The late (and fellow Barrovian) Harry Griffin wrote an intriguing piece for the Guardian, reminiscing about climbing expeditions in the dale during the 1950s, when many of the emptied buildings were still standing. It is an absolute joy to read. Click here. I had not heard of the Goggleby Stone until photographic blogger Colin Griffiths drew my attention to it last year. For a splendid image of this magnificent survivor, visit Colin’s The Rich Gift of Lins here. And for a detailed and fascinating account of Shap’s standing stones, visit the Shap Community Website here. Keld chapel of ease is worth a visit on a wet afternoon. If Mrs Taylor’s not at home, the key is hanging on the wall near her front door. Click here. Finally, Shap’s Cream 17 coffee shop is an extremely pleasant place to spend half an hour after a walk. I had black coffee with buttered scones and strawberry jam, which is the sort of thing you do when you’re from this neck of the woods. Click here. 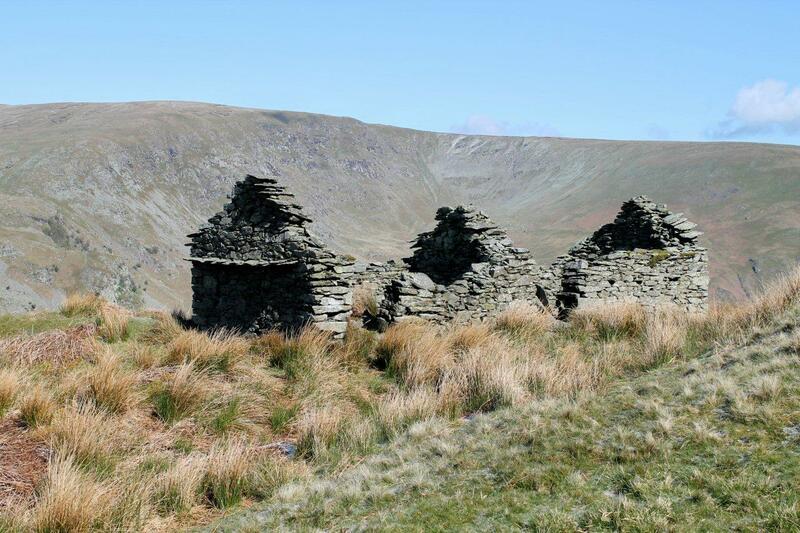 This entry was posted in Archaeology, Camping, Corpse roads, Death, Environment, Ghosts, Hiking, History, Mountains, Walking and tagged Lake District, outdoors, The Lakes. Bookmark the permalink. Beautifully written & a fascinating in-depth insight into Lakelands corpse road’s. I’ve often wondered about the corpse roads, Mardale & Shap attracting me the most, in reading this Alen alot of my questions have been answered. Hi Paul. Thanks for that. It’s a great walk and I can thoroughly recommend it. Is a dead man a bit tasteless ? Ha ha. That bloody helicopter wouldn’t get out of the way. It was hovering over Shap all the time I was there. That last point’s interesting – the road being the beginning and the end. I wish I’d thought of that. Not so sure about the Long Pigs being tasteless. I’ll steer clear of that one, Danny. 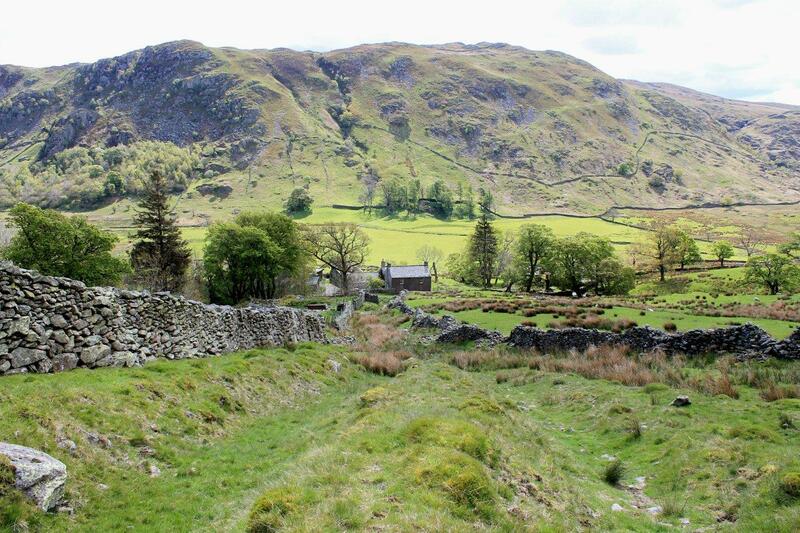 That would be right up your street – a good walk with plenty of history thrown in. I’ve read a wee bit about Scottish coffin roads in the north-west Highlands, mainly in a brilliant book by Daphne D.C. Pochin Mold, ‘Roads from the Isles’. Hey, thanks for that. I’ll take a good look through those later. Like your blog, by the way. This is part of our annual Winter Walk, usually in January, but in reverse. Park in Shap, over the corpse road, camp at Haweswater, up Gatescarth, night in the bothy, back at Shap for food and drink. Always good fun, and always some weather! Great write-up, learned a lot! Now that sounds like good fun. Mind you, Andy, I did this at the end of May and it was damned cold at night, with hail and ice. I shudder to think what it’s like in January with about 15 hours of darkness thrown in. I like the sound of the “back at Shap for food and drink” bit. A very interesting piece Alen, we have a bridle path called the Burial Road only a mile from our house which starts (more likely finishes) at Feckenham Church complete with lychgate. Hi Geoff. That’s interesting. It would be fascinating to see a map of all these old routes. But it appears that most of them have been forgotten since they fell out of use. Hej Hanna. That didn’t occur to me. Stuart Lawrence has been dead for quite a few years. Interestingly, his nickname at school was Zombie. Now that’s really spooky! There is layer upon layer of history in these places and the tales of spirits and the like must have all become intertwined over the years. Walking in the footsteps of these people really brings the history alive, I really enjoyed reading this and watching the video Alen. Hi David. Thanks for that. Yes, there are some deep layers of history that are probably too deep to penetrate because a great deal of that knowledge has just faded away. But it’s rewarding just to have a bash and see what turns up. Beautiful country with a fascinating history. Thank you for taking us along. I’m truly amazed and enjoyed immensely. 3,000 lbs is a LOT of butter. Hi Dohn. What I meant to do before posting this article was work out how many packhorses it would take to carry 3,000lb of butter – but it slipped my mind. According to the font of all knowledge, Wikipedia, (not all of which can be relied on) a typical packhorse can carry up to a third of its own weight, which works out at 250 to 300lb. So we’re looking at a minimum of ten horse-loads of butter a week passing over the mountains. Yes, that’s a lot of butter, especially from such a small community. Ditto. Both your identities should work now, Dohn. I tried deleting one but got in a muddle and nearly lost both of them. An entertaining and informative post. I never knew much about these old roads other than the throw away lines in the odd guide book. Thanks for the link too. Hi Colin. It’s a pleasure. I didn’t realise the Goggleby Stone was just part of a huge avenue of stones that has been slowly quarried away. It must have been pretty spectacular at one time. Apparently the name “Shap” means Heap of Stones, so that’s probably what the name is referring to. Enjoyed that one Alen. Would have loved to have thought up that trip. And you’ve been in a cafe I have not visited! My dictionary defines Truss Gap as follows: Truss is a Cumbric variant of W (Welsh?) drws meaning doorway. The gap bit is obviously redundant and added later. Also seen in Trusmadoor back of Skiddaw way. Greg, I mentioned the cafe specifically for your benefit. Being the middle of the afternoon it was pretty quiet, except for five women on the next table who were discussing a recent night out – and that was entertaining in itself. The coffee and scones were excellent. The Truss Gap explanation is interesting. Another relic of the Celtic tribes that used to inhabit the area. I hadn’t come across Trusmadoor so I’m going to look it up now. PS. I’ve just discovered that if you type “Shap” into Bing Maps it takes you to Supreme Headquarters Allied Powers in Europe, which is not where I want to be at all. I’ve walked bits of this route Alen, but never all of it in one go. There’s another Cumbrian coffin route between Arnside and Beetham. Maybe I should post about that one. I can’t promise a film and singing, you’ve raised the bar there! Hi Mark. Yes, I’ve not heard about the Arnside to Beetham corpse road so I’d be interested to read about it. Had a laugh over your final comment. If my singing’s raised the bar then it can’t have been very high to start with! Really interesting account of the history of this route. I know there are many places here in the Highlands which make reference to coffin roads, but have not studied them in detail. Great photos and video to accompany the text. Hi Sheila. Yes, I must look into the Scottish routes. It’s always interesting to add a bit of colour and history to a walk – especially when the mist’s right down to the treetops. Alen an interesting and enjoyable post with plenty of background which puts your posts a cut above your average walking blog. Keep them coming ! Hi Mark. Thank you very much for that. What a nice thing to say. I found it as i am looking into doing expedition for my degree (adventure & media if you can believe there is such a thing) and we take the shap road every day to get to newton rig. Excellent work! Hi Bob. Better late than never. Thanks for your comment and good luck with the degree. It sounds like fun. Hi Chrissie. Glad to be of service and hope you enjoy the wild camp. I didn’t realise the track past Greg’s Hut was a corpse road, but now you’ve mentioned it, it makes sense. I was up there earlier this year but just on a day trip.